CIA Director Mike Pompeo, speaking at a Senate committee hearing on February. Pres. 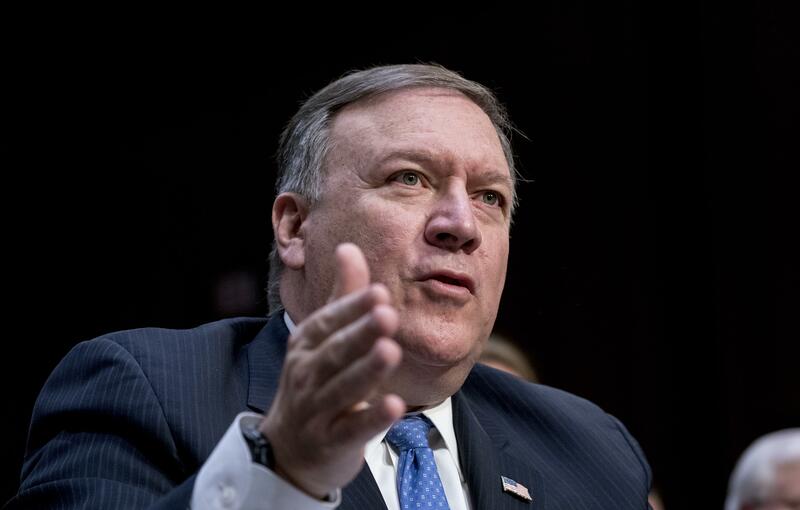 Trump announced Tuesday morning that Pompeo would replace Rex Tillerson as Secretary of State. (Updated at 9:59 a.m. ET) President Trump fired Secretary of State Rex Tillerson on Tuesday morning in a tweet that followed a year of frequent tension between the two leaders. Trump said he is nominating CIA director Mike Pompeo as Tillerson's replacement, which requires confirmation by the Senate. "Mike Pompeo, Director of the CIA, will become our new Secretary of State", the president wrote on his personal Twitter account. "He will do a fantastic job! Thank you to Rex Tillerson for his service! Gina Haspel will become the new Director of the CIA, and the first woman so chosen. Congratulations to all!" The campaign had apparently been in the works for some time. White House officials on Nov. 30 cranked up the pressure on Tillerson with an apparent targeted leak to The New York Times. It revealed the existence of a secret plan by chief of staff John Kelly to force out Tillerson and replace him with Pompeo. The report took care to say that the plan was "tentative" and Trump hadn't yet approved it, but the message to the State Department's headquarters in Foggy Bottom in Washington, D.C., was clear: the White House was finished with Tillerson and wanted him out. Trump also undermined Tillerson's efforts to find a diplomatic solution to the situation in North Korea. As Tillerson kept up support for talks with Pyongyang over its nuclear and ballistic missile programs, Trump said on Twitter Oct. 1 that Tillerson was "wasting his time." Tillerson had also distanced himself from what critics have called Trump's equivocation between neo-Nazis and counter-protesters, who clashed over a Confederate monument in Charlottesville, Va.
Tillerson appeared Aug. 27 on Fox News Sunday and was asked by host Chris Wallace about the way the international community views the United States following Trump's controversial comments about the protesters and counter-protesters in the wake of deadly violence in Charlottesville. Tillerson's departure makes him the latest member of Trump's inner circle in the administration to step down — following a series of White House aides, starting with national security adviser Mike Flynn, continuing on to chief strategist Steve Bannon, press secretary Sean Spicer, chief of staff Reince Priebus and chief economic adviser Gary Cohn — who have left their posts amid administration turbulence. Tillerson is the second Cabinet official to resign, following former Health and Human Services Secretary Tom Price, who was ousted over a travel expense scandal. Tillerson leaves behind a State Department that critics have called a shadow of its former self because of Tillerson's disconnection from the department and the White House's antipathy toward appointing or keeping top talent in the nation's diplomatic ranks. Some ambassadorships around the world and other top jobs at the department's Foggy Bottom headquarters remained vacant. And speculation has swirled for so long that Tillerson might quit that this isn't the first wave of discussion about prospective replacements. A previous go-round centered on Nikki Haley, the U.S. ambassador to the U.N. and former governor of South Carolina. The New York Times reported there was tentative talk that President Trump might appoint his daughter, Ivanka, as Haley's replacement at the U.N.
Tillerson's tenure as America's top diplomat was unlikely. Trump interviewed other, more conventional candidates, including 2012 GOP presidential nominee Mitt Romney, but he ultimately gave the nod to the Texas oilman Tillerson based on a recommendation from former Defense Secretary Robert Gates. "'I told you God's not through with you,' " as Tillerson recounted his wife's remarks. Tillerson had no governmental experience; he went to work in 1975 for Exxon Co., as it was then known, as an oil production engineer. But having risen to become CEO of the descendant ExxonMobil, he effectively served as a kind of head of state of his own — not only running the energy behemoth, but also conducting its foreign policy across the globe in all the places it drilled or refined or conducted other operations. That work brought Tillerson into contact with all manner of leaders, including Russian President Vladimir Putin, who awarded him Russia's Order of Friendship in 2008. Trump and Tillerson met with Putin and Russian Foreign Minister Sergey Lavrov in Germany in June, and then Tillerson continued follow-up negotiations with Russia until his departure from office.